Visited this hotel from 4th Jan to 18th Jan 2013 and found it to be a first class hotel. The room was clean and bright with a wonderful view of La Gomera Island. Food was excellent we heard people complaining about the food but believe me if you go hungry in this hotel it is your own fault. Pool and pool bar area are nice and clean, drinks from the pool bar are reasonably priced, the only downside is they could do with toilets a little closer to this area, the dining room is well managed with staff always happy to serve you in any way they can, do try their Mexican chicken it is amazing and their deserts is to die for. The bar in the evening is to say the least a little cold and the entertainment is truly terrible and remember after midnight you will not get a drink for love nor money. Bar staff are really friendly as are all the staff. Children are well catered for the animation team kept them entertained morning noon and night. Wi-Fi is available free of charge in the lounge area of reception or at a price in your own private room, the location of the hotel is first class beach, bars and restaurants within walking distance. Believe me the be live la nina hotel is truly a warm and friendly hotel to visit. We stayed 2 weeks all inclusive at La Nina, we were fully aware there was a lot of Spanish holiday makers there which was absolutely fine. The hotel is very impressive from the outside with a lovely lobby area when you first walk in. Our room was very basic with a view of a cash and carry, which I wasn't expecting. It had a fridge and good air con which was the main thing. The TV is extremely basic with 2 English channels. The rooms are cleaned every day but our bedding never got changed during our stay which was very appalling. The food is OK, the breakfast and lunch is nice plenty of variety, but evening meals are very boring and the same most evenings. The best night is Thursdays which is Mexican night. Eating out is very cheap which we did quite a lot. The pool area is nice but you have to get out early to reserve your sunbeds as people take them and go to the beach for the day so there is a lot of beds with towels on. The pool bar offers food but it is all cooked at once and left under lamps for 2 hours and it is same every day. The entertainment is rubbish, it is aimed at Spanish families only. The staff make no attempt to speak English to the children. There is no night entertainment apart from a few parrots and a snake. Overall the service we received was disappointing, I would only visit this hotel if you are fluent in speaking Spanish. The resort is nice plenty to do especially if you have children, the beaches are very nice, and the water park is brilliant value for its money. The hotel is popular with the Spanish who accounted for well over half of the guests. Germans and British made up the numbers. English spoken by most staff apart from the maids. Reception - helpful staff, but rather busy at times. We were fortunate to check-in when no-one else was. At times during the week there were long queues. Rooms - Adequate size, large bathroom, disappointing balcony and view (was not a pool view room), 30 channel TV with only Sky News in English, good controllable aircon, fridge (minibar had been emptied), safe (charge 15 euros + 10 deposit). Clean with good housekeeping (our room had no peeling wallpaper!). Pool - two nice pools for swimming separated by a bridge, kiddies pool, jacuzzi, free daily towel change at poolside, sunbeds had plasticised foam mats but there wasn't enough space around the pools - beds were close together, plenty of parasols. Food - breakfast a bit samey - ask for your fried eggs to be flipped as they tend to undercook them, juices and hot drinks all dispensed by self-serve machines. We booked all-inclusive, so helped ourselves to drinks and hot dogs, toasted sandwiches etc from the poolside snack bar during the daytime. Dinner was themed each night and there was something to suit most tastes, microwave was required on more than one occasion to heat food up. Entertainment - not really our scene, there were things organised in the daytime, evenings had good variety although the quality of some acts was poor. Adeje is just along from Las Americas, but walkable along the seafront, taxi 6 euros. Resort is not at all Canarian, with numerous British bars and restaurants and lots of electronics / tacky gift shops run by Indians. All in all, this is a good hotel and is to be recommended. We enjoyed being in a hotel that was not over-run by the British, but the same cannot be said of the resort. We arrived late and a cold buffet had been prepared for us - not good. Reception helpful & friendly. Tried to change room as on busy road & opposite noisy bar - no luck. Room was nice & roomy but basic, nice bathroom with hairdryer & telephone. Breakfast was awful, cold egg, undercooked sausage, and bacon looked as though the whole packet was microwaved. Coffee was good. When we complained to non existant restaurant manager we were told there was nothing he could do, but told us to complain to reception and in the meanwhile use the microwave to reheat. There was also only one toaster that took 4 attempts to toast. The evening meal was much the same very unappetizing, we tried it twice, then ate out. The first night there was no bar service, only help yourself wine for all inclusive guests, I don't know whether this is the norm. Also the restaurant chairs were stained and there was thick dust on the base. I only ever saw cleaners in the rooms! There were no snacks or lunch by the pool, only hotdogs, burgers for all inclusive - again this looked awful. The pool was ok - sunbeds were filthy and the tables. Mattresses had seen better days, plus the umbrellas were all frayed with cotten hanging. I lot of wasted space, all concrete, very little greenery. The entrance to the hotel is fairly impressive, but again wasted space, and furniture has seen better days. Entertainment was all in spanish including the room tv, it was ok what we saw, but we did not stay long. We tried on various occassions to speack to the hotel manager, but there did not appear to be one. We spoke to junior staff only, who were polite, but they could not help with our complaints. I saw a handyman clean the outside tables with a bucket of soapy water and then he rinsed them under the pool shower, all in full view of guests after one of our complaints, but nothing was done about the state of the beds plus he missed our table out. I would not return to this hotel nor would I recommend it. The pictures look fairly impressive, but do not be deceived. There are hardly any sea or pool views, it is just concrete. Even our balcony restricted our view when sitting outside, as it was a concrete wall. Booked this hotel in January with just one hotel confirmed with the hotel in February that the rooms were booked. Arrived at hotel to be told they had double booked and that we were to go to another hotel at the other end of the resort which was no more than a building site refused this offer as we wanted to stay in the area we booked. After about 5 hrs we found another hotel in the area that could take all 6 of us hotel Jacaranda (we have stayed here before and know its great so we agreed) as we were told if we did not accept an alternative hotel they would call the police the only problem was that the Jacaranda was all-inclusive and I refused to pay any more for the holiday as we could have booked the Jacaranda cheaper than the la Nina but we wanted to try something different. I found the staff very unhelpful we got no apology from the hotel or from the h10 group even after contacting them on our return. While we were waiting for them to find us suitable accommodation a bus load of about 40 came in and had no problems booking in when I asked the reception why they had rooms and we did not why it was our rooms that were cancelled all they said was the were Italians and we were not. If going to this hotel make sure that you have a holiday rep if not your on your own and they will do nothing for you. Great hotel, great food, great staff, great rooms, excellent all round. Saw this hotel on a previous visit in March 2005, and loved it on sight!!! Entertainment is as usual ....pretty rubbishy - but I have stayed in most of the nicer hotels in the South of Tenerife and I have to say the same for all of them...not to worry I don't spend my nights "indoors" anyhow!!!" Especially loved the pool area of the hotel, as the visitors are mostly Spanish, they are civilised when it comes to the Sunbeds!! !...they get a towel...lie on it for an hour or so...take it back and get on with their day, leaving beds free for the next person. Unless they happen to be English of course, then the towels stay for a fortnight as you would expect. I don't intend to tell many people about this hotel...I like it too much! Would I visit again??? - In a heartbeat!!! Organised trip ourselves and chose hotel after research. We found food excellent and plenty of it. If we had full board I think we would need carrying home. The staff at the hotel were good. There were only a few English people there which adds to the atmosphere. The entertainment was a bit naff but we may be a bit fussy in that department. It is not the newest hotel on the block but it is well worth a visit. 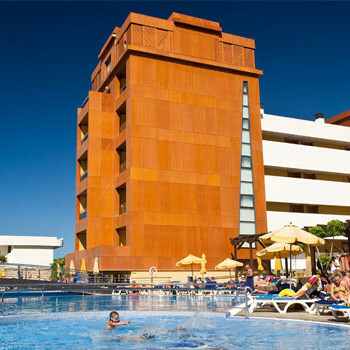 We holiday abroad two or three times per year, and have been to Tenerife many times but have neaver stayed in a h10 hotel until our stay in May. All I can say is it was nice hotel but the food was awful. we tried lunch dinner and even the pool bar but we had to go and eat out,when we went to the pool bar I ordered a pizza asking if there would be any fish on it I was told no! when it arrived there was tuna and prawns on it so needless to say I could not eat it. I would go back to this hotel again but on maybe B&b only.